Volvo is enjoying centre stage popularity. 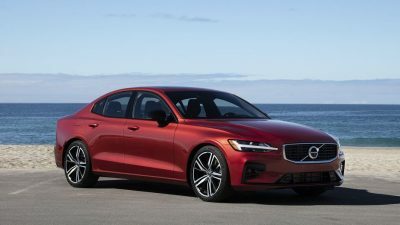 New car buyers on the lookout for a luxury car with style, prestige, performance and safety are being captured by the sweeping designs of new Volvo cars and their efficient class-leading, powerful engines. You know you have arrived when you head into the CBD area in a brand new Volvo S60; the car’s looks are breath-taking and the attention to detail are of the highest standard. Drive the new Volvo S60 and enjoy strong performance, efficient engines and plug-in hybrid models capable of zero-emissions running. Scandinavian details, sculpted sides, a sleek profile and muscular shoulders above the rear wheels highlight the car’s distinctive character and give it a strong presence for any occasion. At the front, the prominent front grille wears the Volvo emblem proudly, while the long hood and deep front bumper exude muscle and affluence. Full LED headlights are the Volvo norm and with their signature Thor’s Hammer design created into the headlight design you have an unmistakable presence both in the daytime and at night. You can add your own selection of exterior styling kit that includes front and rear splitters, a rear diffuser and integrated split tail pipes that make a beautiful impression for the onlooker. A number of special alloy wheel designs can also enrich your Volvo S60’s unique character. Let’s head inside and take a look at what is a stunningly gorgeous luxury interior. The Volvo S60’s sleek dash display boasts a tablet-like 9-inch Sensus Touchscreen as your intuitive command center for on-board infotainment features. A unique set of air vents have slender, metal-finished controls with diamond-pattern finishes for an exquisite finish. Volvo S60s with the R-Design trim highlight the sporty nature of the car, with Metal Mesh Aluminium furnishings and contrast stitching for the seats, tunnel console, doors and gearshift. Models with the Inscription trim level boast beautiful driftwood panelling and unique wood treatment – just stunning! A 2019 Volvo S60 has all the smart technology, so seamless smartphone integration with Apple CarPlay and Android Auto is fitted as standard. The car’s intuitive touchscreen, or voice control, is all you need to access the S60’s world of entertainment; Sensus Connect is the key to a range of additional apps to enjoy Internet radio and audiobooks as well. The Volvo S60 range also comes equipped with On Call, and app connection with your phone, tablet or wearable device. You can use this technology to pre-heat or pre-cool your S60 before you enter the cabin. You can also lock or unlock the car, find it in a crowded parking lot, or even have packages delivered directly to your car. Volvo On Call is your personal organizer, letting you know when your appointments are imminent. Ride quality of the latest Volvo S60 is superb. The 2018 Volvo S60 offers a choice of drive modes so that you can tailor your driving experience to your mood. Three default settings for the engine, automatic gearbox, steering, brakes and stability control system put the focus on driving, comfort or fuel economy and emissions. You can also create your own combination with Individual mode. In plug-in hybrid models, an AWD mode is also available. The optional Four-C active chassis is an electronically controlled system that gives you even greater control for every imaginable road surface. This system constantly assesses the current road conditions and your driving style and adapts the shock absorbers to meet yours and the car’s requirements. When switching between the car’s drive modes, the Four-C system also adjusts the suspension characteristics to suit. Plenty of superior grip comes with the addition of AWD, though even in FWD guise the S60 is remarkably nimble. The Volvo S60 will seat five adults in comfort. It’s not just the front seat occupants who will enjoy maximum comfort because there are heated rear seats available also. Volvos seats are renowned for their long-distance comfort and they provide support that leaves you feeling refreshed after any long distance journey. Comfort seats have power height adjustment as standard. Contour seats provide even greater side support, as well as multi-directional lumbar support and an adjustable cushion extension. Volvo S60 cars boast a glamorous panoramic glass roof as standard which brings a beautiful natural light to the spacious cabin. The specially tinted glass reduces unwanted heat and UV radiation. A power-operated sunshade makes it easy to keep strong light out if necessary, while the front part of the roof can be tilted or opened to provide extra ventilation. Very nice and stylish! Music lovers will appreciate the range topping Bowers and Wilkins audio sound system with 1100 watts pumping from fifteen speakers. Studio, Individual Stage, and Gothenburg Concert Hall are mode settings for the sound system. There is a Harman Kardon Premium Sound system that has a very high-quality sound from 14-speakers at 600 watts. This system boasts Automatic Level Adjustment which creates a consistent level of volume and intensity, while special algorithms adjust the output to compensate for external noise. What’s the new S60 like on the power ad delivery? New and innovative engines balance strong performance with low emissions and fuel consumption to give exciting performance through Volvo’s extensive experience in turbocharging technology. Base models use the 186 kW Direct Injection turbocharged T5 engine and FWD for the driving force. Torque (350 Nm maximum) feels nice and strong throughout the engine revs allowing for smooth, powerful performance that never strays away from being sensibly efficient. Volvo S60 T6 models are AWD and offer beautiful control over all road surfaces. The blend of ride comfort and control is first rate, and should the mood take you there you can make full use of the 236 kW, 2.0-litre turbo engine. There is as much as 400 Nm available for easy quick passing manoeuvres. The T6 engine also has a supercharger, for even more exhilarating performance. Power is sent through a smooth-shifting 8-speed Geartronic automatic transmission with steering wheel-mounted paddles on the R-Design variants. Very nice! Volvos have given the flagship T8 S60 sedan the premium performance package. This is the hybrid motor and so 300 kW of power packs a very healthy punch, and as much as 640 Nm of torque is accessible between 2200 and 5400 rpm. Hey, and this is all from a 2.0-litre capacity! The S60 T8 Twin Engine models have plug-in hybrid powertrains that give you exceptional performance, flexibility and efficiency with a variety of Drive Modes. Pure mode provides enough zero-emissions electric power for the average daily commute, while Power mode ensures outstanding performance. Default Hybrid mode lets you choose between electric and gas, or combines them, to keep you moving as smoothly and efficiently as possible. I can’t not mention at least some of the safety features present in the new Volvo S60. The 360˚ SurroundView Camera makes parking easier with a bird’s-eye view of your car and its immediate surroundings on your large touchscreen display. Pilot Assist helps make driving in heavy traffic less tiring. It uses the Adaptive Cruise Control function to set your speed and distance to the vehicle in front of you safely. Pilot Assist works at speeds up to 128 km/h. An ultra-high strength Boron steel safety cage wraps all occupants in a cocoon of safety. Crumple zones in the front and rear dissipate as much energy as possible in the event of a collision. City Safety systems spot potential danger and helps you to avoid it. The radar and camera technology identifies other vehicles, cyclists, pedestrians and large animals ahead, day or night. Run-Off Road Mitigation is a standard safety feature that detects if the car is about to leave the road unintentionally, between 40 and 85mph. It uses steering and – if necessary – brake support to guide the car back on track. Run-Off Road Protection helps reduce the chance of a serious injury if the car leaves the road. This innovation includes energy-absorbing front seat frames that cushion vertical impact, as well as prepared safety belts that hold you tight, even before impact. It’s quite the car for the discerning buyer. Check a new 2018 Volvo S60 out for yourself and join the fan club. 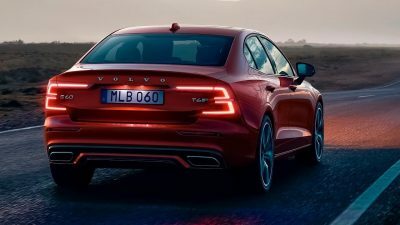 For any more information on the new 2019 Volvo S60 or, for that matter, any other new car, contact one of our friendly consultants on 1300 303 181. If you’d like some fleet discount pricing (yes even for private buyers! ), we can submit vehicle quote requests out to our national network of Volvo dealers and come back with pricing within 24 hours. Private Fleet – car buying made easy!